Check out the new blog feature! Now when you click on the “Print & PDF” button you can customize how much of the post prints! You can include or exclude intro text and/or pictures. Hope that helps with printing and saving recipes! These bars are definitely a taste of spring. While they’re not quite as delicious as my favorite cheesecake, this Blackberry Cheesecake, they’re easier to make and less fussy to share. The lemon and blackberry goes great together and while I was a little skeptical about baking the blackberries, it really brings out the sweetness in them. These have a subtle sweetness and aren’t as rich as traditional cheesecake. The the graham cracker crust adds the perfect amount of crunchy to the creamy filling. Preheat oven to 300°F. Line a 10×15″ (or 9×13″ would also work) baking dish with parchment paper. In a bowl, combine graham cracker crumbs, sugar and butter and mix with a fork. Pour into prepared pan and press down evenly to form the crust. In a large bowl, beat the cream cheese on medium speed until fluffy. Add eggs one at a time. Slowly pour in the condensed milk, then add in the lemon zest and juice, beating until smooth. 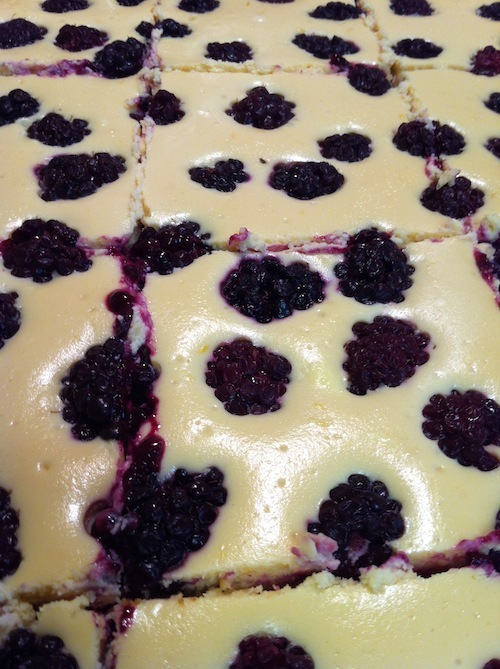 Pour mixture over the pressed crust and top with blackberries. Bake for 35-45 minutes or until mostly set. Turn off oven and let sit for an additional 30 minutes. Remove from oven and allow to cool completely. Cover and chill for at least 8 hours or overnight.